Special December Promotion – 20% Off! Our customers belong to a wide range of ages, educational, ethnic and economic backgrounds. The one thing common among them is that they love NoseSecret for the change that it has brought in their lives and the ease with which inserts make them feel transformed is something that binds them all together. Hence, the fan base of NoseSecret is quickly growing. If you too are a fan, make sure you follow us on the different media channels. That’s where we share the latest news about NoseSecret products. Following regularly might let you cash in on our promotional coupons. Such offers are for limited quantities and time periods. Our Facebook page has a growing number of fans. It is linked with our blog that you are currently reading. Hence, once you have ‘like’-ed our Facebook page, you will no longer need to keep visiting our blog. Your Facebook newsfeed will automatically update you on what we have been up to. To watch actual results, watch the collection of videos on our YouTube Channel. The real life demonstration by our satisfied customers will amaze how quickly and easily NoseSecret works. If you have gone through similar experiences you too can make your own fan videos and share them with us on the channel. NoseSecret was featured in MSNBC’s The Today Show with Kathie Lee and Hoda. You can watch the video here and see how interesting it was for viewers to see a non surgical DIY nose job. Even more amazing was the fact that it was done so quickly and cost-effectively, without any risk of anything going wrong. Cross your fingers for more coverage of NoseSecret on different TV channels. Our website has all the information you would want to check out. 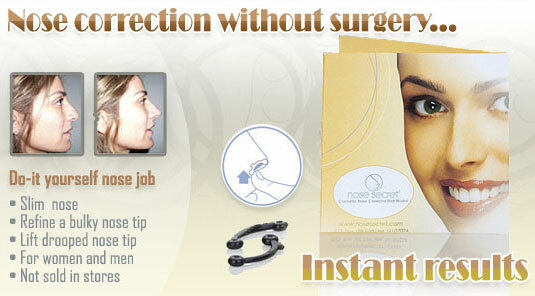 From prices, benefits, payment methods to photos of real people who used NoseSecret, videos and much more. Our page on Twitter also is regularly updated. So if you enjoy Tweeting, this page is a must follow. You can also check out the other pages that NoseSecret follows.